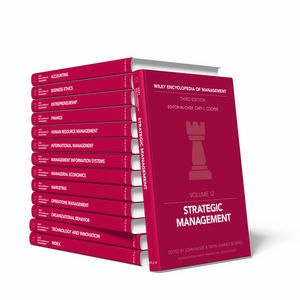 Now in its third edition, this multi-volume Encyclopedia of Management, has been revised and updated to chart the major developments that have occurred in: digital technologies; ethics and governance-related issues; innovation; emerging markets; organizational networks; and new avenues of sustainable business growth. New to this edition: Technology & Innovation Management , Volume 13, V K Narayanan & Gina O’Connor. The encyclopedia is available online through Wiley Online Library, a major database of Journals, Handbooks and reference in the field. Cary Cooper?is Distinguished Professor of Organisational Psychology and Health and Pro Vice Chancellor for External Relations at Lancaster University. Until October 2003 he held a chair at UMIST where he was formerly Deputy Vice Chancellor. He was honoured with a CBE (Commander of the Order of the British Empire) in the Queen's Birthday Honours List in June 2001. The (American) Academy of Management honoured him by electing him as one of the first UK Fellows in 1997, and in that same year was honoured as a Companion of the Institute of Management (now the CMI).